PBS starts airing The Hollow Crown in the United States this week, which of course will culminate with Henry V, source of the above and many other inspirational quotes. I have a lot of feelings about these productions, and if I can get my act together, I’ll post them as each episode airs. I’ll have a few other balls in the air by then, though: not only does my final quarter at Medill start a week from today, but I also plan on revisiting one of my great storytelling loves of all time, HBO’s Band of Brothers. In some ways, I’m in journalism school because of this show. I owe my interest in oral histories to a friend who, knowing I liked this miniseries, shoved Studs Terkel’s “The Good War” into my hands and told me I had to read it. During my newsroom quarter, I focused on reporting on veterans and military families, which is, I’ve discovered, a beat for which I maintain a passion. 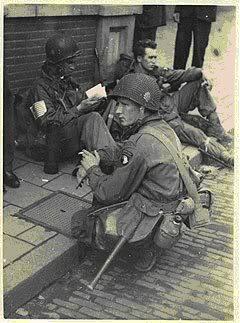 If I’m honest, my interest in the paratroopers of the 1940s pushed me to seek out the stories of today’s service members, to whom I’m very grateful for their trust. 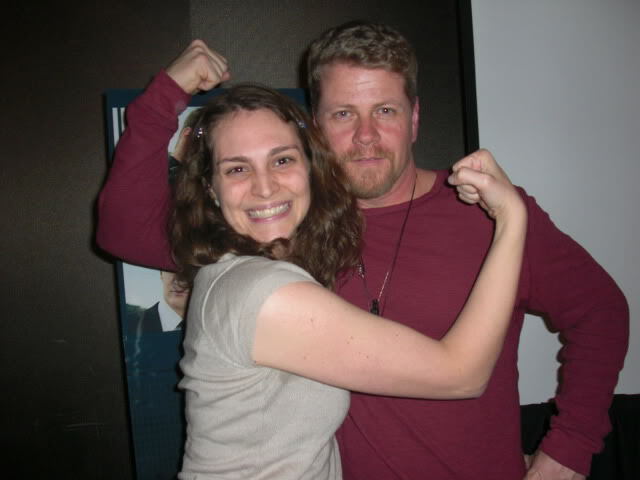 Michael Cudlitz (Bull Randleman) and I can do it! I’m looking forward to coming back with a fresh set of eyes. I don’t think I’ve seen an episode for at least a year and a half, and it’s probably been two or three years since I last saw the whole series. But I’ll admit to some hesitation about diving back in. Caring about Band of Brothers means you also care about the surviving men of Easy Company. You hear about it when their health fails or they pass away, and even if you knew an actor’s portrayal instead of the man himself, your heart still aches a little. Many of the websites and forums that used to post notices seem to have gone quiet in the intervening years; I almost don’t want to know who we’ve lost since I last checked in. I also wonder about the place of Band of Brothers in U.S. American society itself. No matter how harrowing the art, war and art are always going to be different. It’s the art that tends to become part of our mythology, though, and I have a lot of questions about that. Each episode has a focal character, a foil character and a clear theme. “Day of Days” is Winters, Guarnere and seeing the elephant. “Carentan” is Blithe, Harry Welsh and coping with fear. “Replacements” is Bull, Garcia/Hashey/Babe and taking care of each other, and so on. We have the first and last episodes that are really about everybody, and serve an explicitly narrative purpose — establishment (“Currahee”) and denouement (“Points”) — though even those had their themes, first among which I would say is unity. Other series themes include politicking and power dynamics (“The Last Patrol”), disillusionment and sudden truths (“Why We Fight”), and leadership and transitions (“Crossroads”). Each episode has a very distinct cinematic and directorial flavor: “Crossroads” has Tom Hanks and his typewriters and the differing visual styles between frame story and flashback; “Bastogne” is a largely silent fairy tale; “The Breaking Point” has all those quick asides and intimate conversations; “Why We Fight” has the broken elegance of gentile Germany paired with the horror movie of finding the camp. This is some of what I hope to focus on during this rewatch. Any further recommendations, links or articles or books or documentaries, would be most welcome. 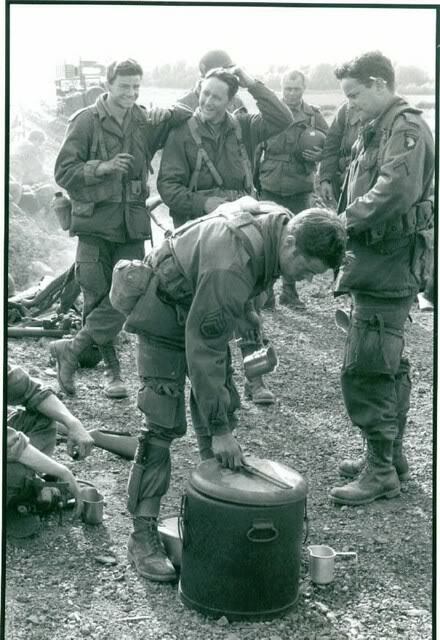 I also hope to reread Susan Sontag’s On Photography and Regarding the Pain of Others, and, if I do the timing right, at least a few of the biographies, autobiographies and oral histories from the veterans themselves.